Come along if you were born in 2001 or 2002! On Saturday the club is holding trials open to both youth members and non-members born in 2001 or 2002. The session will take place from 9.00am until 10.30am. 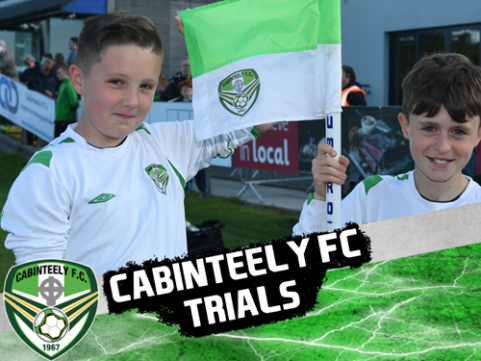 Cabinteely FC offers excellent coaching and facilities for our young players to provide a pathway into the National League of Ireland teams. If you think you have what it takes to play this level of youth football, we’d love to hear from you. If you have any questions or if you’d like to attend but have difficulty with the date, please contact Ed Diggins (manager) on 086 813 4305 for further details. If you’re coming along, bring full training gear, including shin guards, water and wet gear, if required. Hi Talemwa, thanks for the interest in Cabinteely. Best to call the club office at one of the numbers in the heading of the website home page. Regards. Hi, it’s a pity that you missed the trials. Do call the number suggested in the news item or the club office number, as in the heading of the site. Best wishes.